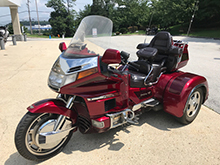 This machine has been donated to Bob, the chief fundraiser at Bob’s BMW for the Pediatric Brain Tumor Foundation and the Ride for Kids program over the past 25 plus years, by one of our long time customers. 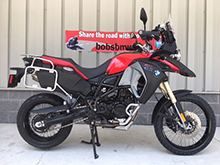 The generous individual who turned over the bike, keys, manuals and clear title to Bob will receive the letter for tax deduction purposes from the PBTF; all Bob and by association Bob’s BMW gets is credit at the next RFK® event (September 23, 2018 at Turf Valley Resort in Ellicott City, MD) for making it all happen plus the good feeling of helping fund the research and support programs that will one day cause this terrible childhood disease to vanish from the earth and eventually our collective memories. In the case of this Donated Bike to benefit the PBTF and RFK we suggest you contact Bob personally. Call 301-742-4931 or email bob@bobsbmw.com. NO REASONABLE OFFER REFUSED BY 09/21/18! Let’s start with the first thing some viewers may notice in the images that were taken before Bob gave this nice trike conversion a literal sponge bath in the parking lot. In all but the final two images taken after said bath the Rubber Ducky is missing. He’s been claimed internally by Suzanne (Bob’s wife) who has a collection of these goofy little squeakers. So, cute that he/she/it may be, he/she/it is NOT included in this sale. Bob feels there’s great value remaining so please read on. Viewers should also note that except for images # 6371 and 6372 all photos were taken in a warehouse, pre bath and dirty, under dreadful, artificial fluorescent lighting. The final images (#6371 and #6372 & post sponge bath) should serve as your benchmark for what it really looks like in bright daylight. Of course it will look even better with a through washing with some degreaser, lots of soap and water. An actual detailing by the next owner will make it look better still. 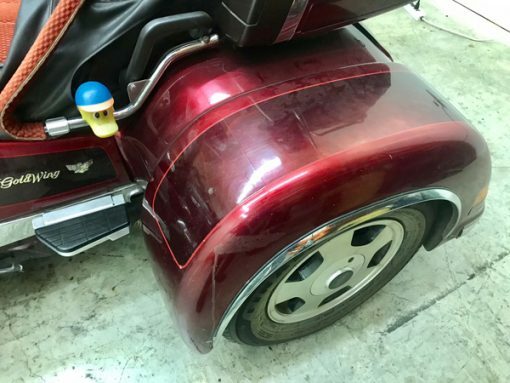 Perhaps the next owner will splurge and have our in-house professional detailer do that to their new trike We are sure the extra expense will deliver some impressive results even if every scratch, minor blemish, small environmental stain or nick will not vanish from this fine 23 year young machine. 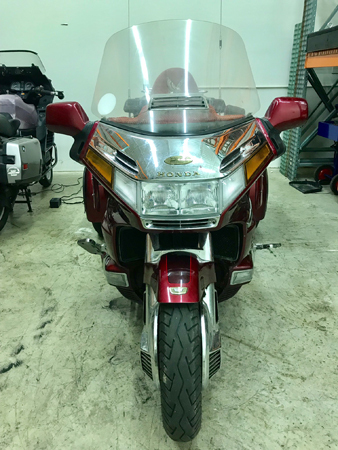 Prospective buyers should know that donated bikes, where the intent is to raise money for a worthy cause, are sold exactly like we would sell one a PROJECT BIKE. That means it is an AS IS SALE without any warranty, expressed, written or implied. To start this process we urge every potential buyer to ask questions if anything is not clear in the description. 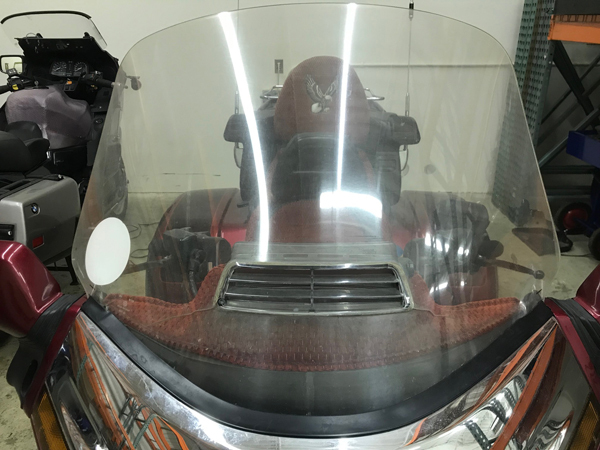 We’ve nothing to hide and our only goal is that the new owner of every DONATION or PROJECT BIKE feels they paid fairly and got good, if not great value in the transaction. We have a disclaimer about selling/buying our PROJECT BIKES. We encourage people to read it completely and then call to schedule a time to visit and inspect the offering in person. Bob personally took this bike in, completed the evaluation and inspection. He has known the prior owner for over 20 years. He took it out for two test rides (so far) and he gave it the sponge bath so the dust would not be the first thing a new owner might encounter. Bob will be taking on one small mechanical task, the only one he believes it really needs, as soon as the parts arrive. The best days to reach Bob at the dealership are Monday’s, Wednesdays and Thursdays from 10 to 5, but he is available on some Saturdays from 9 to 3 as well. In all cases a call or email ahead and a scheduled visit are required as this is not all he does here at the dealership and he does not wish to disappoint anyone who just stops by in the hopes of being squeezed in. You can read all about Bob’s PROJECT BIKES and the selling terms here on our website at: https://www.bobsbmw.com/new-motorcycles/project-bikes/ Over the years, we’ve probably sold over two-hundred PROJECT BIKES and every client has been exceptionally happy with their acquisition except one. That’s a great report card and a pleased customer, even when the sale is “AS IS” is always our goal. 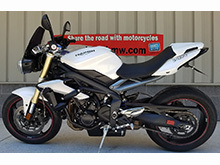 Just as it is with the acquisition of a new BMW or one of our exclusive ADVANTAGE CERTIFIED pre-owned used BMW motorcycles plus the frequent occasions when we get to sell a donated bike to raise money for a good cause. So now to the Trike in question. It was reported to Bob that it was acquired used in 2000 from the Honda dealership in Rapid City, South Dakota and almost immediately converted into a Trike by an authorized California Sidecar and Trike dealer. It has had the same owner for the last 18 years. 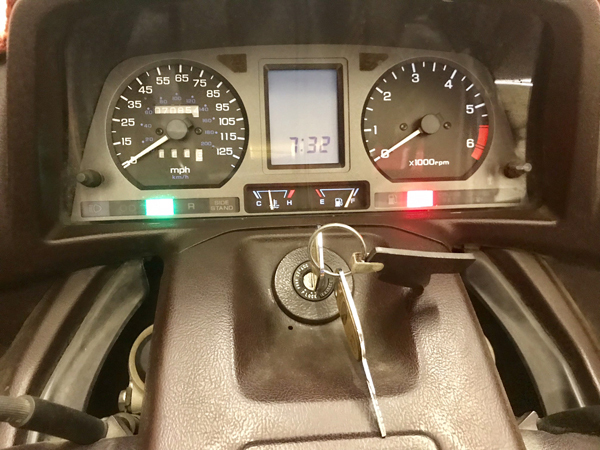 It had about 14,000 miles when that took place and today, after Bob has ridden it about 30 miles it has just under 70,900 miles. It starts up fine with full choke and needs the choke unless being ridden at higher RPM’s. 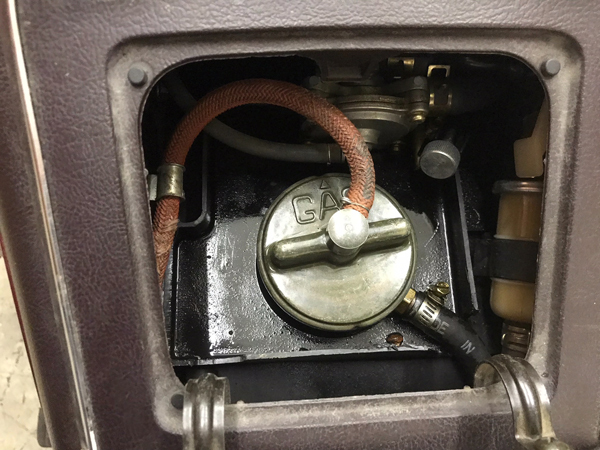 This is because , to the best of Bob’s diagnosis, the “automatic petcock assembly” is failing and slightly leaking fuel (it’s located right next to the gas cap), Bob has already ordered a new one to be installed as soon as he can make the time after it arrives. That should resolve the mostly minor issue. Once on the road, this trike has tons of power, rides very well, shifts smoothly, handles quite enjoyably on the straights as well as the tight turns we have surrounding the dealership. 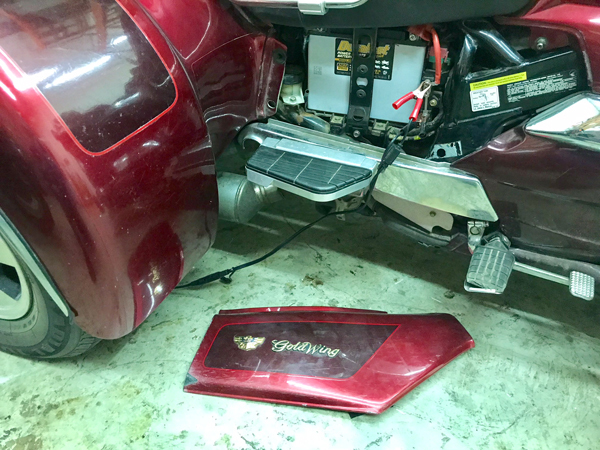 The brakes bring this trike to a pretty quick stop but the system does feel like it could use a complete flush and bleed of the front and rear systems to perform at its best and remove a little spongy feeling that it has. All other systems, to the best of Bob’s knowledge, work OK including the reverse which is as smooth as silk in his opinion. Bob has not tested the stereo, tape player or CB radio and any interested buyer is welcome to check them out but they are what they are. When Bob attempted to dial in a local radio station all he got was static but he does not know this system at all. 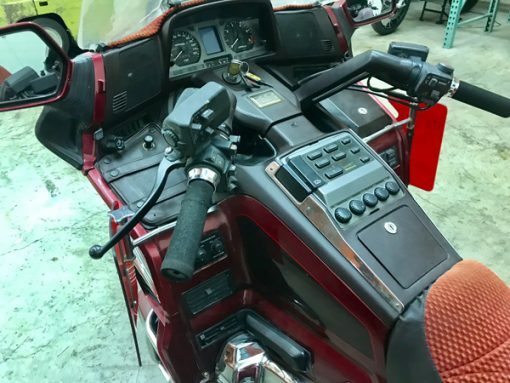 He suspects that any new owner would want something Bluetooth connected to their helmet or helmets and would not be placing a high, if any, value on this old system. The only known issues Bob discovered during his full evaluation are as follows: the trunk in the sidecar is latched and so far Bob has not been able to find the release to open it, but he’ll keep working on that. 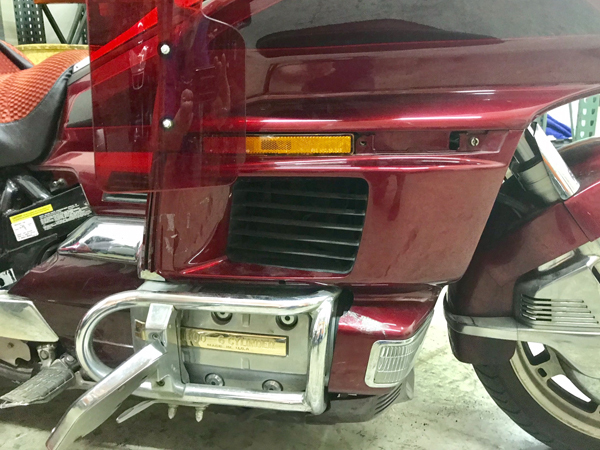 The release for the trunk on the bike is not functioning either but a heavy duty cord was installed by the prior owner which allows for easy release of the latch and access to anything in the trunk which you can see in one of the images. These two items will be the next owners tasks to complete. To the donors best memory new tires were reported installed in 2012; Bob notes that all three look fresh, have most of their original tread and any noticeable wear which is not much, is very even. The front Bridgestone tire is dated 1106 (does not match well with that installed in 2012 report) and does vibrate a little at speeds in excess of 65 mph. A rebalance is in order but even at an indicated 80 mph (steady speedometer needle too) this machine rolls down the road quite well. The trike tires are of automotive size and compound and Bob could not find a date stamped on them (perhaps on the inside?) but they are from a company called Finalist and are radials and appear, like the front to be in excellent condition. 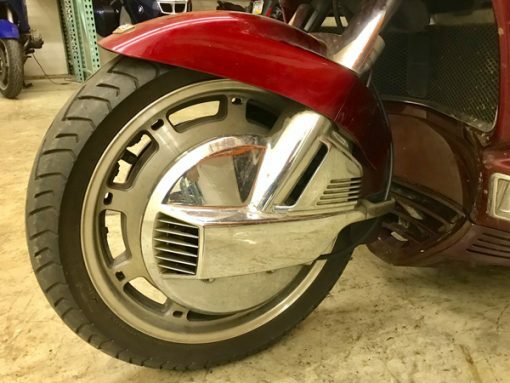 The prior owner did most of his maintenance, as he has done on other machines and also claimed that shock absorbers were replaced in 2013 along with plugs and a light tune up done he completed in 2014 – all before he began to ride it less and less due to his age. 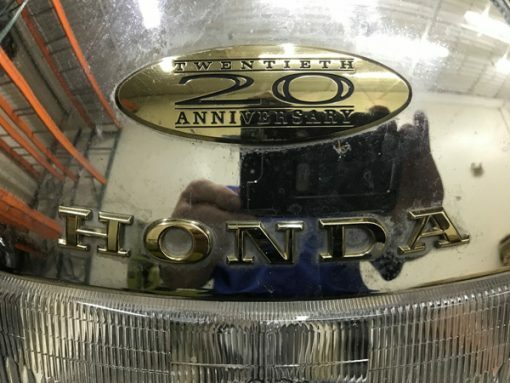 He told Bob that he personally changed the oil and filter and did other light maintenance every 6,000 miles. In addition to what you can see in images please note the red velvet seat cover was removed to reveal an almost new and perfect original seat; it would appear that cover has been in place possibly since new as there was lots of fabric dust underneath to clean off; the cover is still serviceable and included but Bob felt it looked better with the cover off; the rain cover is included. The air wings function well. The J&M system has not been tested, again it’s old technology that hardly anyone uses. 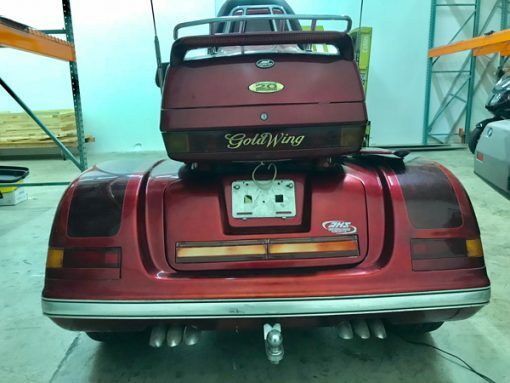 There is a luggage rack attached to the trunk in fine condition. The stock grips have a common foam style grip covers. It has the stock factory driving lamps built into the fairing. 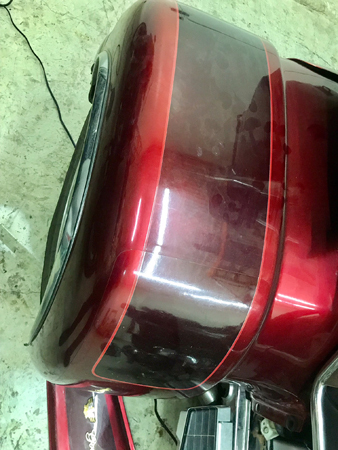 Clear vinyl stone chip guards cover both fenders and they have a very slight yellowish tint this many years down the road. It has Honda highway pegs and adjustable height passenger floorboards. 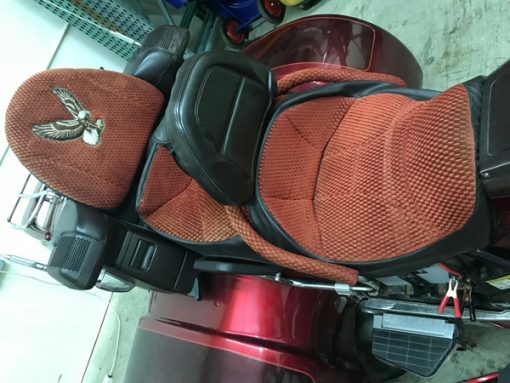 There is also an adjustable and removable riders backrest; it also has a trailer hitch included although the owner claims he has never used it. 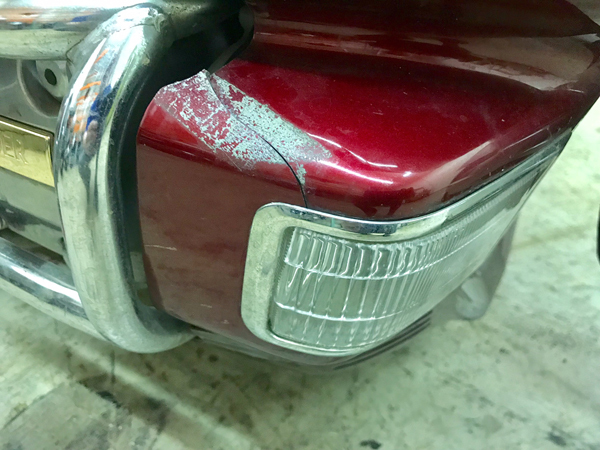 Cosmetically it has very few big blemishes and those can be seen in the images provided – the stain on one fender, the crack around one driving lamp, a small scrape on the trim on one fender and perhaps the only one that should be addressed immediately is the windscreen. It has several cracks that cause it to vibrate slightly at high speed but it has aged out and is a little hard to clearly see through. We suggest replacing it with a fresh, readily available one so your visibility is perfect. The side panel that covers the battery on the right side was removed by Bob to keep it on a battery tender and is in serviceable condition but one tab on the back is damaged as shown. You can see all this and more in the provided images and for a serious buyer before they might visit, Bob would be pleased to provide additional images. A sharp viewer will note that we have one image inside the trunk before we got locked out – there’s no bag of money or dead body in there. 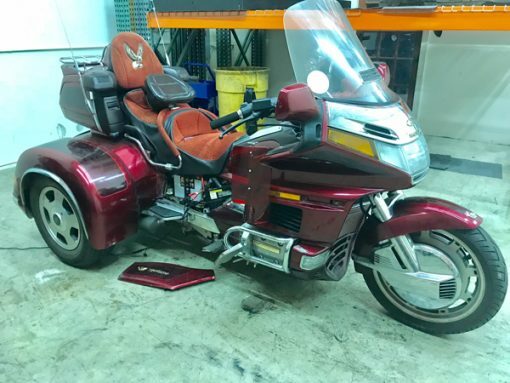 Despite its age and small list of needs it’s a low mileage trike that has had but one owner as a trike conversion and only two owners since new. It’s been garaged when not ridden or on travels over the years so there are no hidden pockets of rust or corrosion we could find. A professional detailing will make it a head turner in Bob’s opinion but that will not make it look new. It already looks darn fine after his 20 minute sponge bath and light towel wipe down as mentioned earlier and for way under $10,000 it’s a pretty hard to beat offering. Bob located plenty of comparable Honda Trike conversions for sale from all of the companies that create and install these kits to help place a fair market value on this one. The vast majority have higher miles with quite a few well over 100,000 miles. Most of these were 1992 to 1995 models. 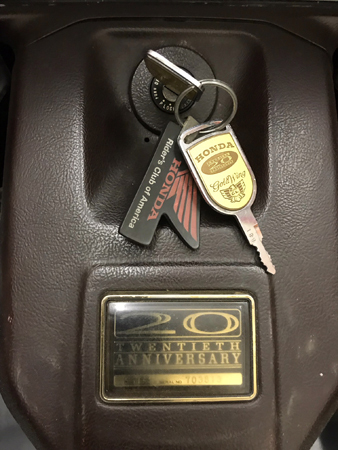 Bob also found several slightly newer ones from 1996, 1998 and 1999 that had mileage as low as 23,000 and up to 41,000 that would qualify as very low mile machines. Prices vary based on miles, condition and extras plus maintenance history as is to be expected. This one is being priced with the new automatic petcock assembly installed (be it Bob’s labor or one of our tech’s) and we believe that will solve most of the fuel delivery issues at low choke start-up. But we are not doing more than this to find it a new home. It is an “AS IS” transaction as mentioned earlier. 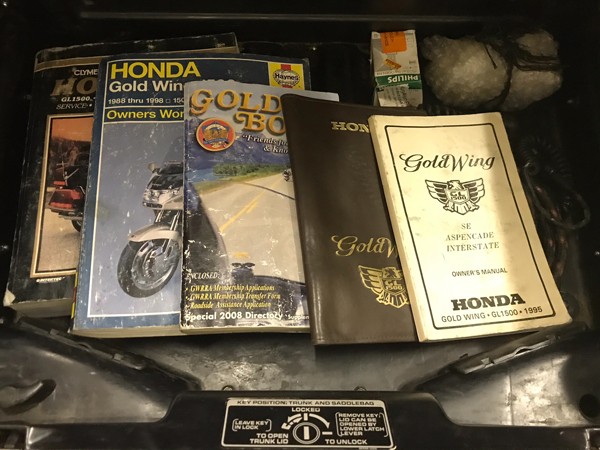 The purchase of this 23 year young (or old if you prefer) Honda GL1500 Anniversary Gold Wing California Trike Conversion includes two (2) keys and an array of manuals you can see in one of the images that includes the original owners book, a pair of service manuals and a document folder with some info on the trike. There’s also a spare headlight bulb. It is fairly offered to benefit a truly worthy, well run non-profit which you could learn more about at this link: www.curethekids.org or even ask Bob a few questions about since he’s been involved for about 25 years and spent almost ten years serving on the BOD even though his kid nor any of his staff, friends or neighbors have had a child with a brain tumor. 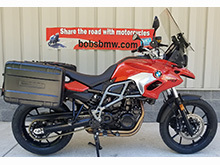 We feel it’s priced to sell, reasonably quickly with good fortune, at $8,495 and suggest you call Bob (301-497-8949 x218) or email him at (bob@bobsbmw.com) to make an appointment for your own inspection and possible test ride.